Interesting, interesting. I'd be great to see one of these styles alive again. "Moehl has the original drawings of the lighthouse, as well as a scaled down version, and said he contacted the United States Coast Guard headquarters in Cleveland to explain what exactly he needs from them. He said the replica would be a shell that matched the original design, but explained the structure itself would be far less complicated. Bourland and Moehl added the next steps are to find out whether or not the breakwall would support the base of the replica structure and then to take the plans to a few different iron shops to get an accurate estimate on what it would cost to build the replica and have it installed." We will be meeting with Moran Ironworks, the company which built the new lantern for McGulpin Point, next week to identify construction methods and to obtain approximate pricing. I'm getting the impression that the new light will be fabricated from metal rather than wood? Construction of the original was a steel skeleton support covered with corrugated iron. We would likely go with something like 1/8" or 1/4" steel plate for the exterior skin, so that it is strong enough to withstand the waves which roll over the pier. 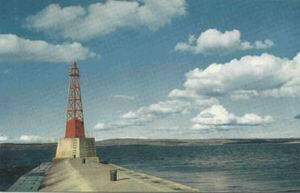 It was such waves which swept the original pagoda style beacon from the pier on December 14, 1924. Thanks Terry, for some reason I was always under the impression they had been wood framed. A modern steel beacon should certainly be strong enough to hold up out there on the breakwater. I'm thinking that, using modern techniques, this shouldn't be that difficult, but certainly still a challenge. Terry, what would you estimate the timetable for a project of this size ? Chuck, It depends on a number of factors, including total cost, how quickly funds can be raised, and obtaining Coast Guard and Army Corps of Engineers approval. If we can pull it off, my best guess would be somewhere between six and eighteen months - but at this early point, that's just a guess. Here's another little bit of history for the full story. Noah, you are correct, the base for the D9 was the same one erected for the acetylene tower. The USACE are completely removing the old breakwater, replacing it with a driven sheet sided structure, similar to that at South Haven. As a result, both the concrete base and D9 have been removed. I have also identified with 90% certainty that the keepers dwelling is still in existence. Terry, once again I have to thank you as I was not aware that the breakwater is finally being replaced. Any idea on when that is to begin, if it hasn't already? I remember a few years ago when the structure was damaged in a winter storm and the issues raised about it's integrity. As I'm sure GLLKA has planned it, with the new breakwater it makes this a perfect time for the recreation effort. Now I know it's just a D9, but I have to ask, any idea on it's fate? 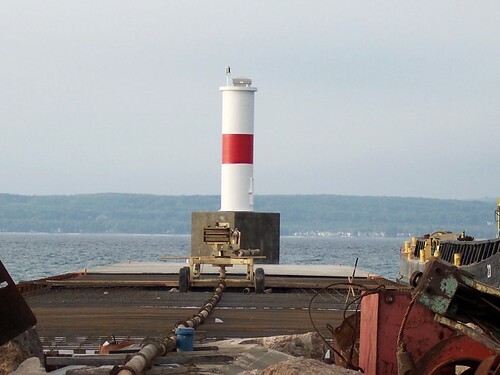 Noah, they began work on the breakwater in Petoskey back in May. I posted a couple of early photos on the GLLKA FaceBook page in the Misc photo section on the work back on May 26. I do not currently know what happened to the D9. I read in the Petoskey paper that it was being removed and shipped off for repair, and would be returned, but have not yet confirmed that fact. Did you see my latest post in the "Wind Point" thread on this Board about the repainting of Round Island Passage? You might find that photo of interest, also. I will likely be heading into Petoskey at some time in the next couple of days, and will take some updated photos of the work there. I also heard that the repaint of the Grosse Ile light was underway about a week ago. Might already be finished, if anyone is heading down that way. Wow I didn't realize how far along the project was, and I'll have to go look at those pictures on the Facebook page that I missed. I did see those Passage Light pictures, its great to see that work underway. I saw that light on a GLLKA cruise at least 4 or 5 years ago, and even then rust was forming fast, so I can only imagine the shape it was in. Should be sparkling when complete. I was in Petoskey Monday night. The breakwater reconstruction is well underway and the D9 has been returned.